Supplements: Blood Under Absalom utilizes Flip-Mat: Arena, Flip-Mat: Waterfront Tavern, and Map Pack: Inns. 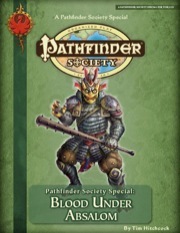 Note: Blood Under Absalom is designed for play in the Pathfinder Society Roleplaying Guild. It may be run anywhere by anyone, as long as there are 5 tables playing the scenario simultaneously and are in contact with each other. To inquire about access to this scenario, refer to the Organized Play Convention Support Policy. Lots of combat yet lots of creativity. I played this over Play by Post as a level 3 sorcerer in a subtier 1-2 game. I had a lot of fun. This was a combat heavy scenario, and it was easy for spell casters to run out of magic. So I kind of cheated and brought my Level 3 sorcerer. I remember playing the Sky Key Solution with my low level Magus and it was tough to choose spells. An encounter that started us naked was very interesting. Or at the very least without armor. I also liked the opportunities to charm my opponents, since many scenarios don't use charms or ignore Charm Person. This was fun. Actual fun was had. I just played this module at DunDraCon on February 18, 2017. We had approximately 40 players for this giant multi-table game. At my particular table was Tonya Woldridge, along with a Venture Agent and a Venture Lieutenant. Eric Bennett was running. I tell you that because I want you to understand that my review may be biased. I was at a table filled some of the best players in Pathfinder Society. 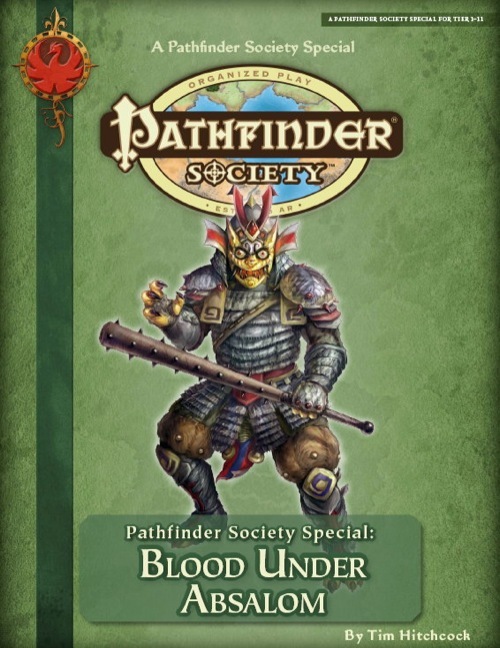 Because of this, I am fighting a strong urge to rate this 5 stars, as it was simply the most enjoyable gaming I've experienced in Pathfinder Society in recent memory. Some things I can tell are due to the module itself. The opening was insane (and good), as the gem brawl turned into a bloodbath of epic proportions. Other reviewers have commented about how chaotic and fun that was. The next 2 encounters were run-of-the-mill combats, though I see some other reviewers liked them a lot. Some things I can tell are due to the people I played with. The theater encounter? It was absolutely hilarious, due to both Tonya and the Venture Agent actually improvising funny puns and verbal barbs at the gaming table. The non-stop banter and cheesy over-acting was excellent. The final fight (and re-fight) was so-so as far as the module goes (it drags a bit). However, I personally had a wildly fun time, as the Venture Lieutenant at our table was playing a "Bless Equipment cleric" (oracle?) and boosted my barbarian through the roof. I did hugely inappropriate damage thanks to all of his buffs, and had a great time in the process. At one point a player asked to stop for just a moment, and he said, "I just want to say how nice it is to play with people who know the rules and know how to complement each other's strengths without stepping on toes. This has been amazing." I'll preface this by saying that I ran this with a table of 4 very experienced players (In a room of about 30) at tier 3-4 and I had a lot of fun. Also; SPOILERS ahead. Things ran far smoother than expected after reading through, and players remained engaged throughout. It helped that my party trounced anything in their path until they reached the elemental room. The first wave was a cake walk, but because of the elemental traits, DR/-, and high damage output, I nearly TPK'ed simply by virtue of the fact that other tables were taking too long. My party did their best just to stay alive. I had to double and triple check that I was running the right enemies due to the number of times party members fell unconscious. Had I been more vindictive I could have definitely wiped the party. The monk fight immediately after felt a lot fairer while still making for a climactic boss fight. However the multi-table event definitely did not feel like we were a room of players working together. With no opportunity to influence other tables, it felt disjointed, and led to complication in the boss room as mentioned above as we waited for other tables to catch up. Another gripe of mine was the theatre scene. This was an opportunity ripe for actual roleplaying with costumes and props and everything, but it ultimately fizzled down to a rematch against a previous already-easy enemy team but made easier again. Sure Pathfinder has a robust combat system, but it felt like a missed opportunity all round. Highlights include the Ronin sub-plot, and the scramble for the rubies. The players immediately engaged the Ronin when they first encountered him and handled the barmaid-scuffle without hesitation. They also had a lot of fun fighting wave after wave of competitors for more rubies, and it really helped create a feeling of a packed tavern. Like I said, the overall game was very fun, and the players enjoyed themselves. Which should always be the goal of any RPG. I look forward to playing more multi-table scenarios like this one in the future. So let's be clear: this one isn't high-brow literature. But the plot is coherent and has a certain kind of style. For the whole thing, think of it as a kind of 90s video game/martial arts tournament kind of atmosphere. Roll with the silliness and then it's pretty fun. That also illustrates the problem with this scenario. It's a series of fights (not a bad thing in itself) with some awkward RP interludes that much resemble cut scenes in a video game. There's not much flexibility here. There are also some moments in fights where you're given an objective, like "get to that person". But the way it's written, you're supposed to fight some monsters first, and so should the other tables. Only when all the tables have killed X monsters can you get to that person. But this kind of falls apart when you start using fly spells or dimension door etcetera. You basically run into an invisible wall of "scenario says no". Again, a lot like a video game. It also shows how clumsy the early multi-table specials were. This one relies a lot on synchronizations between all tables, making it feel rather forces. I recently played Legacy of the Stonelords which had much better synchronization mechanics. RPG technology advances, it seems. Despite these flaws, I had fun playing this. The fights are flavourful and occasionally quite challenging, especially if you play with a 4-person party, like this one is meant to be played. Having a head GM with a flair for drama also helps. I played this special today, together with around 26 to 28 others today in the Netherlands. As is the case with all the specials, you're bound to have a lot of fun simply because you can interact with other tables, as well as creating mayhem and mischief for everyone else. It's silly, it's hilarious and based on that alone I have to recommend this special in general. That aside, I do have some issues with this special, three issues to be precise. The first is the fact that the amount of time per section is simply too short. We barely had time to actually roleplay things, something we would have liked to do. Now things just ended too quickly and honestly ruined some of the fun. This is more problematic if you take issue number two in account: other tables crushed their opponents so quickly, that we only had one round against our opponent before we already got to move on. So there we were, ready to swing at the big guy since we had just buffed ourselves, we move in for the kill and.. the guy surrenders and we get to move on already. Yea, that's no fun. My third issue is that the plot seemed utterly random and didn't make a lot of sense. Maybe this was because of stressed for time we were, but to me it seemed as if they had a lot of fun ideas for encounters and just decided to put them all together, only to create some story to make sense of it later. That said, certain parts were unique and a lot of fun. It's a shame it needed a fair bit of explanation and if you combine that with a small time window, you might not get to get the full experience (and entertainment) out of it, which really is a shame. So, it's essentially a meatgrinder that can be really fun, but really suffers on the time-aspect. For a scenario, that's a mere 3 stars. However if you want to have a good time, participating in a Special is always a recommendation. This might not be the best Special out there, but you are still guaranteed to have fun. Product page now live! Feel free to discuss the special and review it here. It will remain exclusive to conventions and special game days until August of next year, when it will be available for general purchase. To schedule this scenario at your local Pathfinder Society event, please contact campaign management at pathfindersociety@paizo.com. Have there been any changes made to it since Gen Con? Could you please add the year with the release date? We have finite room in the price block, but the full release date under the product description contains the year (and the day of the week). Wasn't this product supposed to be available for purchase and download on September 4th, 2012? Are there any special requirements to run this for PFS play or can we run it with our single table group? It requires a minimum of 5 tables playing simultaneously for this one.